If we had to guess which character from Girls would wear head-to-toe sequins, we would go with Shoshanna. No doubt about it. But, real life is a whole other story. 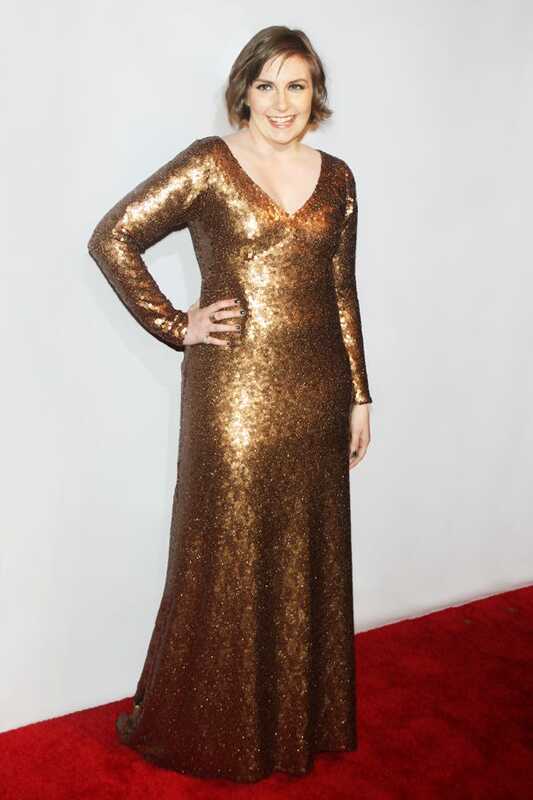 Lena Dunham arrived at the 2014 Point Honors New York Gala last night in a fully sequined gown, and it's not the first she's sparkled this much in public. Wearing a dress from the Marc Jacobs fall '14 collection, Dunham took to Instagram to exclaim, "I save my sequins for when I know the gay boys will be out #traffickinginstereotypes." The dress was originally seen on the runway at a cropped-to-the-ankle length, this version swept the floor, giving it a slightly more demure appearance. As mentioned, Lena is no newbie in the high-shine department. She wore a silver Rochas dress earlier this year to the Girls season three premiere. We thought the sleeveless, midi-length number looked really lovely on her — statement making, but not overpowering. And, while last night's outfit may have been all about the drama, we kinda wish she went for a similar silhouette as the first.